HUBER+SUHNER, leading international manufacturer of components and systems for optical and electrical connectivity products, has today launched its innovative Omni-S MIMO 4×4 antenna at the InnoTrans exhibition in Berlin. 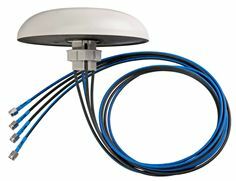 The new omni-directional SENCITY® Omni-S MIMO 4×4 antenna features four ports and can be used as a 4×4 WiFi MIMO multi-port antenna. It was especially designed to install Internet in trains. HUBER+SUHNER made a conscious effort to produce a flat and unobtrusive antenna – a design which prevents damage and vandalism. The antenna meets the stringent rolling stock standards EN 50155 and EN 45545-2, covering an exceptionally wide range of application needs. Due to a single-hole mount design, the installation of the antenna on site is straightforward. Exhibition visitors can see the HUBER+SUHNER SENCITY® Omni-S MIMO 4×4 along with a variety of other technologies for rail in Hall 2.2 at InnoTrans 2016, Berlin, 20-23 September, at a joint stand (207) with SWISSRAIL.